Information on conversion coefficients is now available directly in the nuclide Datasheets. The table for the gamma rays now contains the alpha total (total conversion coefficient) in addition to the values for the k and l shells. 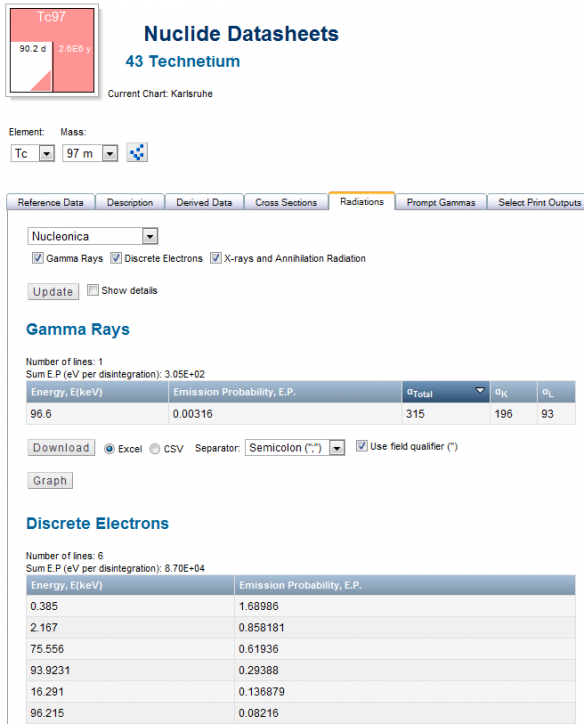 The energies and emission probabilities of the electrons are listed in the discrete electrons table. The example shows Tc 97m. As can be seen the transition at 96.6 keV is highly converted with a total conversion factor of 315. Also shown are the individual conversion factors for the K and L shells. IUPAC has recommended the names Flerovium (Fl) for element 114 and Livermorium (Lv) for element 116. The new names were submitted to IUPAC in October 2011. Over the next five months there is a public comment period. Thereafter, the names will become official.